Kylie Jenner, 21, is the youngest person ever to make Forbes list of the world's billionaires. You might be able to keep up with the Kardashians, but unless you're a billionaire, you won't be able to keep up with clan member Kylie Jenner. That's because Forbes announced Tuesday that 21-year-old Jenner became the youngest person ever to make the magazine's annual list of the world's wealthiest people. After becoming famous from the reality show Keeping Up with the Kardashians, Jenner's popular cosmetics company has given her an estimated $1 billion of wealth. That's good enough for a spot on Forbes' list, although Jenner only clocked in as the world's 2,057th-richest person. Jeff Bezos of Amazon.com Inc. (AMZN - Get Report) ranked as the world's richest person, with an estimated $131 billion net worth. Bill Gates of Microsoft Corp. (MSTF was close behind at $96.5 billion. While America broke its previous record of total billionaires with 607 this year (including most of the world's Top 20 richest), the world as a whole lost some cash at the top. 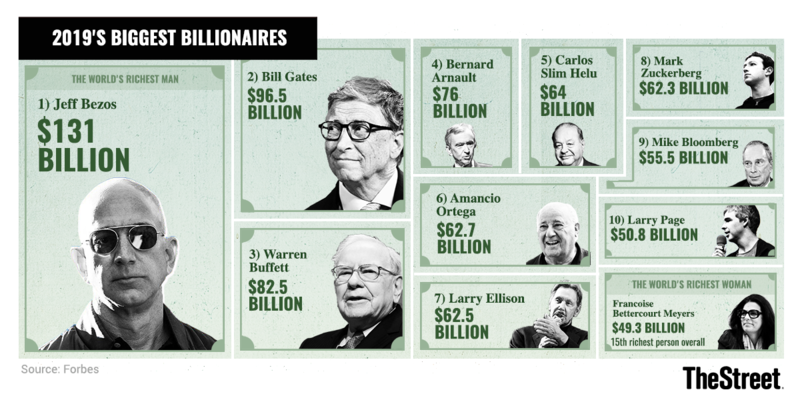 Forbes only counted 2,153 billionaires around the globe, about 55 fewer than last year. Nearly half the globe's billionaires have smaller fortunes than they did the previous year, too, said Forbes. Asia lost some traction despite the rise of China over the decades, but still saw lots of names on the list, such as China's Internet god Ma Huateng of Tencent (TCEHY . Jack Ma of Alibaba (BABA - Get Report) also made the list, as did Japan's Masayoshi Son of mobile telecom and financial institution SoftBank (SFTBY .